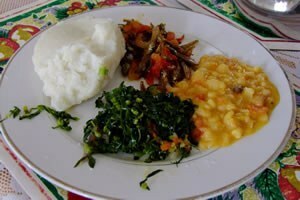 The main meal is nshima (starch powder from maize meal). This is Zambia’s staple food. It goes with any kind of relish as described in the cooking instructions. Relish can either be meat-related or vegetables. In Zambian circles there is a saying that you haven’t eaten any food unless you eat nshima and it’s true! There are 4 components to this dish. 1. Nshima: Requires starch powder (preferably maize meal). Mix contents with water and simmer for 10 minutes or so and then use a wooden spoon to thicken until hard. 2. Kapenta: This is tiny dried fish can be shallow fried with oil mixed with onions and tomatoes. The less spices the better not to mess with the original taste of the fish. 3. Beans: Can be white or red. Cook freestyle. This entry was posted in Zambian Food. Bookmark the permalink. "Disclaimer to those who would like to cook kapenta: your body, clothing and house will smell like oily fish for quite some time after cooking, giving you the ability to relish (no pun intended)such a savory dish."